Ebony was an EXCEPTIONAL person to work with. She listened to my needs and wants, and whereas I didn't have the best to work with or a ton of money, she made it happen for me. I thank you sincerely, Ebony!! We worked with Chris Davis who was very easy going and worked hard to find us the vehicle we wanted with the lowest miles for the best price. Couldn't be happier with the service, would definitely recommend. It was very goood and pleasant they gave me what I ask for and I would tell my friends about the dealership they get A for customer service. World Hyundai is a fair company will do there best to sell you a car.. The dream team at world hyundai took great care of me and my son. We left in a 2012 suburban and a 2010 malibu with zero down . AWESOME! thanks Erik and Edwin !! Thank you very much, Lawrence, for choosing World Hyundai to purchase your vehicles! Thank you for allowing us to assist your in your vehicle purchase, Michael! Glad to hear the visit turned out well! 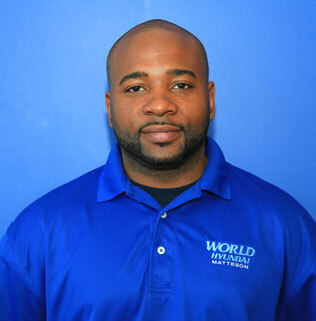 World Hyundai provides top notch service for Joliet Hyundai customer. Thanks to Rory and Dante for exellent service and went the extra mile for us. Our purchase at World Hyundai was top notch! We really appreciate the kind words and look for to providing you with more top notch experiences. Thanks for making us your Joliet Hyundai Dealer. Joliet Hyundai client plans on buying form World Hyundai Matteson again. We are your Joliet Hyundai Dealership! Great experience at World Hyundai. Nakia put us into the car we wanted at the prices we wanted. Very informative. A+ sales staff. Thank you for a great, non-stress experience. We will definitely come back for our next vehicle. Thank you Nakia! Thank you so much for coming to World Hyundai-happy to be your Joliet Hyundai Dealership. Joliet Hyundai client will recommend Mark and World Hyundai Matteson! Mark was a delight to work with. He was personable and listened to my concerns. He was an all-around, friendly "salesman" and I'd recommed him to anyone in my life. His professionalism and honesty was refreshing. Joliet Hyundai shoppers are some of our favorite clients! Thanks for choosing us. We will do everything we can to live up to those kind words. Salesperson went through extra trouble to find us the exact vehicle we were looking for. We did not feel rushed, and the transaction was fast and easy. We are your Joliet Hyundai Dealership!! So glad we could be of service to you. Sounds like you had a great purchasing experience. Thank you for your business! I have had a positive experience with Dennis in regards to purchasing a new vehicle. I do not buy automobiles that often and I was treated very well. We really enjoy helping Joliet Hyundai buyers here at World Hyundai Matteson. Thank you for allowing us to assist you. Dennis was able to work with our request. He met our needs. No messing around, he was professional and we feel we received a good deal on our new car.